Explanation: What's that in the sky? Although there was much to see in this spectacular panorama taken during the early morning hours of a day in late September, the brightest object in the sky was clearly the planet Venus. In the featured image, Venus was captured actually through a natural rock bridge, itself picturesque, in Spitzkoppe, Namibia. The planet, on the left of the opening, was complemented by a silhouette of the astrophotographer on the right. 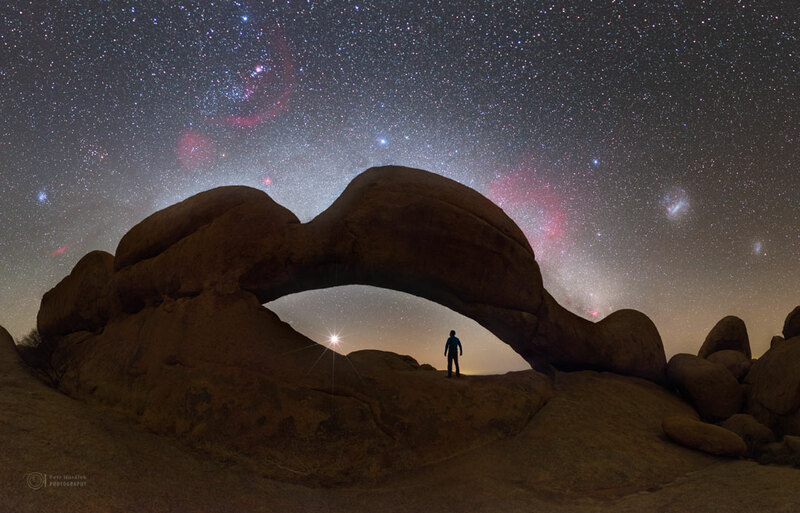 Above and beyond the rock bridge were many famous icons of a dark night sky, including, from left to right, the Pleiades star cluster, the Orion Nebula, the bright star Sirius, and the Large and Small Magellanic Clouds. This week, Venus remains visible to the east in the pre-dawn sky, being complemented by Mars, which is angularly quite close.